Evidently, during this week I feel a Little bit romantic, because, like yesterday, I chose a painting from the same style, although, strictly, this one would be pre-romantic. As in yesterday’s post I talked a lot about the movement per se, I don’t feel like it to do it again, so I’m just going to describe some facts about the painter and to do some personal comment. Jacob Isaaczoon van Ruisdael, as his name says, was son of Isaac van Ruisdael, a Dutch painter not particularly famous. His uncle Salomon van Ruisdael, also was devoted to arts, except that he had a good position in Haarlem. As you can figure, painting, especially of landscapes, was a family business. Little we know about the artist himself, but we do know the fact that, during his life, his work wasn’t acknowledged, which made him poorer and poorer. So poor that, being and old man, thanks to the contacts he maintained with the Mennonites, van Ruisdael had to ask for asylum in an almshouse, maintained by donations, where he died two years later. 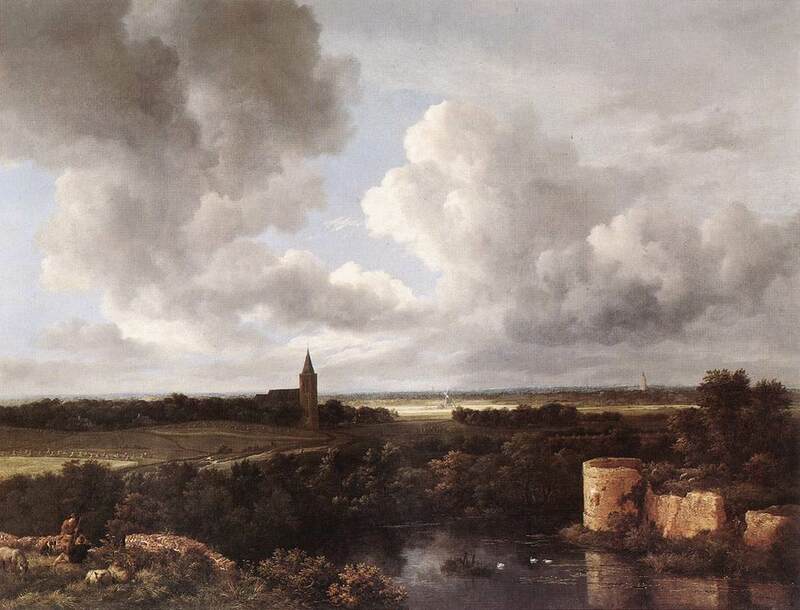 Van Ruisdael’s work is about landscapes full of details and a well achieved lightning. Contrary to other Dutch landscape painters, van Ruisdael never needed to portrait a scene, but he would sum different elements into one big composition as a whole. He was interested especially in nature, distant cities, ruined buildings and, often, marine landscapes. Personally, I had no clue who van Ruisdael was or what he had painted. I had never heard of him, but I couldn’t avoid saying “what a great painting!” when I first saw An extensive landscape with a ruined castle and a village church. In it, we see the countryside with 4 buildings, two in front and two in the back. At front right, we see the ruined castle, surrounded by a river (or a lake) and a lot of vegetation. More to the centre left, we see a couple of roads that end in the church. These two constructions give the name to the canvas. Also at centre, but more at the back, I see a typically Dutch windmill, but they are used to pump water and, near it, I can’t see any water it could pump. Finally, at the back to the right, we see the tip of another building that, although I assume is another church, I am not sure. However, these elements are, from my point of view, accessory to how the work makes me feel. The ingenuity of the countryside is in a clear contrast with the dark and threatening cloud formation that covers it. A shy light from the sun covers the windmill and seems to forgive it the destruction that approaches to the region. The painting feels dramatic, but incredibly subtle. It shows what one feels in that time of calm before the storm. You know what I mean: when the wind starts blowing and everything around starts to slightly vibrate as it were electric… when the static becomes dynamic and one smiles. Just because. Storm. In an open space. Surrounded by nature. That would be a good home. ~ by Álvaro Mazzino on July 29, 2010.
believe I missed so many entries since my last visit! Hello there, I discovered your blog by the use of Google whilst searching for a related subject, your site got here up, it seems to be great. I’ve bookmarked it in my google bookmarks. I seriously love your blog.. Great colors & theme. Did you develop this site yourself? Please reply back as I’m hoping to create my own website and would like to find out where you got this from or what the theme is called. You’re so awesome! I do not suppose I’ve read something like that before. So great to find another person with genuine thoughts on this topic. plant so you have to buy more plants for the goldfish aquarium. stems which can make it an ideal selection for slopes and banks. bonsai plant: and sign up to your FREE 7-part introductory mini-course on how to grow miniature bonsai trees. simply much more standard stocks, that are more famous. to find out if what is the news is worth trading or not. This entry was posted on July 29, 2010 at 14:43 and is filed under Baroque, Romanticism.You can follow any responses to this entry through the RSS 2.0 feed.You can leave a response, or trackback from your own site.